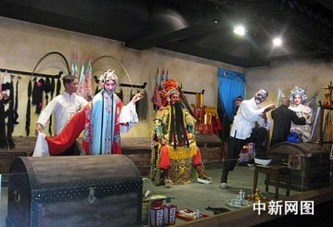 Originating in Shaanxi Province, the local variety of Chinese opera is Qínqiāng (秦腔). You will come across locals singing Qínqiāng in the parks, and there are more formal performances in the afternoons in the teahouse at Huáng Miào. 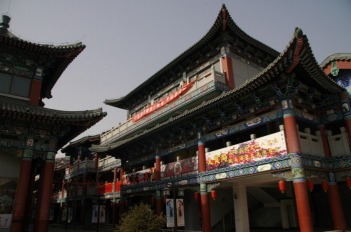 Now you can find out more about this regional Chinese opera by visiting the new Qinqiang Opera Museum in Lanzhou, on the north bank of the Yellow River. It is part of the ever-developing Lanzhou 'Golden City Pass' Culture and Customs Quarter (兰州金城关文化风情区 Lánzhōu Jīnchéngguān Wénhuà Fēngqíng Qū). It is good to finally see this area taking shape. It certainly looks impressive at night, but up until now there hasn't been a great deal to see and do there. Not being in Lanzhou these days, I won't have a chance to visit this museum in the near future. So, if you do visit, please send a comment.